Cooperstown, New York (CNN) - President Barack Obama stopped by a Little League game earlier in the week - clearly a warm-up for his visit to the baseball shrine in Cooperstown. 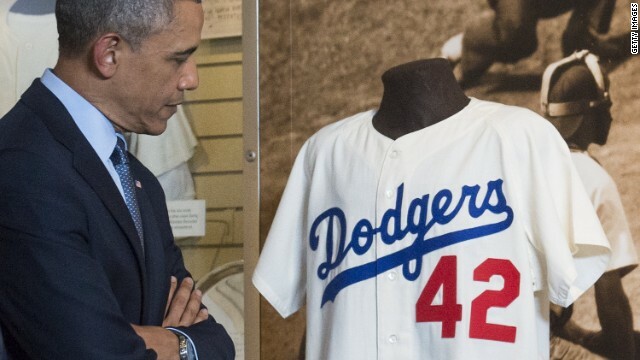 Obama on Thursday became the first sitting president to visit the Baseball Hall of Fame in upstate New York. He eyeballed treasured artifacts, including some from his hometown Chicago White Sox, and pitched his economic message at a heralded tourist attraction and job creator. At one point, the President eagerly picked up a glove that once belonged to New York Yankee great Joe DiMaggio. "How about that," Obama said, clearly delighted to see such a thing up close. He also stopped at a display for "Shoeless" Joe Jackson, a star on the scandalous 1919 White Sox team, dubbed for posterity as the "Black Sox" over allegations key players threw the World Series for money. "He had small feet," Obama said, noting that "Shoeless" Joe was a touchy subject for White Sox fans. In formal remarks, Obama talked about the economy. "I'm actually here to talk about jobs, good middle class jobs and believe it or not places like this institution, the Hall of Fame, (have) something to do with jobs and economic growth," he said. The Baseball Hall of Fame draws nearly 300,000 visitors each year generating about $150 million in economic activity in rural Otsego County, about 70 miles west of the state capital of Albany. Obama said that success could be replicated elsewhere but it has to be easier for foreign tourists to enter the United States. With a goal of increasing the number of annual foreign visitors to 100 million by 2021, Obama directed the Department of Homeland Security to work with other agencies and 15 of the largest international airports across the country to streamline the entry process. "We can automate passport controls. We can bring in top talent from the private sector to find best practices, to help move lines faster. We can add new staff at Customs. We want to bring in more visitors faster and more jobs faster," said Obama. Visitors swarmed Main Street in Cooperstown as locals and tourists hoped to catch a glimpse of Obama. Sal Grigoli, who was working behind the counter at his family's pizzeria business, said it's nothing new to see the streets around the Hall of Fame crowded with people, but a presidential visit is definitely out of the ordinary in the picturesque village. "I appreciate him coming here building up the town. To come to a small town like this is unbelievable," said Grigoli. "The whole town depends on tourism. For this town it's vital so it's great that he's here." Inside the museum, 11-year-old Decker Clark was dressed in a Yankees cap and held a baseball as he craned his neck to see Obama. He and his parents traveled from Colorado and got a pretty big surprise when Obama was at the museum on the same day. "It's cool. We didn't expect that. We had it all planned and then we realized he was coming today," Clark said. Focus on education–not mucho, mucho. You cant make this crap up. With all that's hurting this country, this is what the pres does, another photo op??? Obongo was suppose to close gitmo, Obongo was going to be transparent ??? You don't have a big enough comment section to list his failures. All though he did win BIGGEST LIAR OF THE YEAR. glad to see the president out and about. This does create tourism and good will. #whocares: Obama on Thursday became the first sitting president to visit the Baseball Hall of Fame in upstate New York. Good middle class jobs??? Another pie in the sky statement or just another lie. Meanwhile the returning veterans continue to wait for health care. Maybe if he has a good round of golf the light will go on in this mans head.